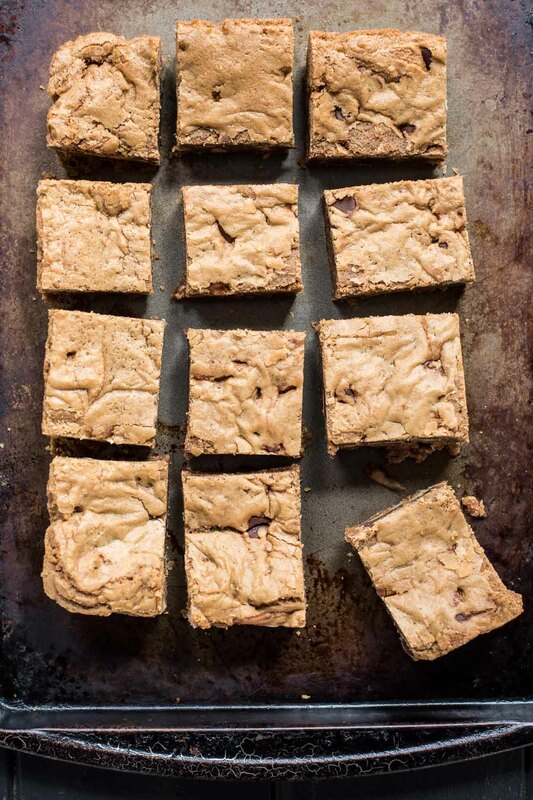 These Brown Butter Pecan Blondies are an irresistibly sweet and simple dessert. Over the past few years, I’ve been working on my collection of “gold standard” recipes. These are recipes for classics, go-tos, the ones I hope to be known for by my kids and neighbors and friends someday. So far, I’ve got my favorite chocolate chip cookie recipe, perfect fluffy buttermilk pancakes, the very best sour cream banana bread, one bowl fudge brownies, and classic spaghetti and meatballs. Next on my list was finding my ultimate blondie recipe. I know the perfect blondie means different things to different people. 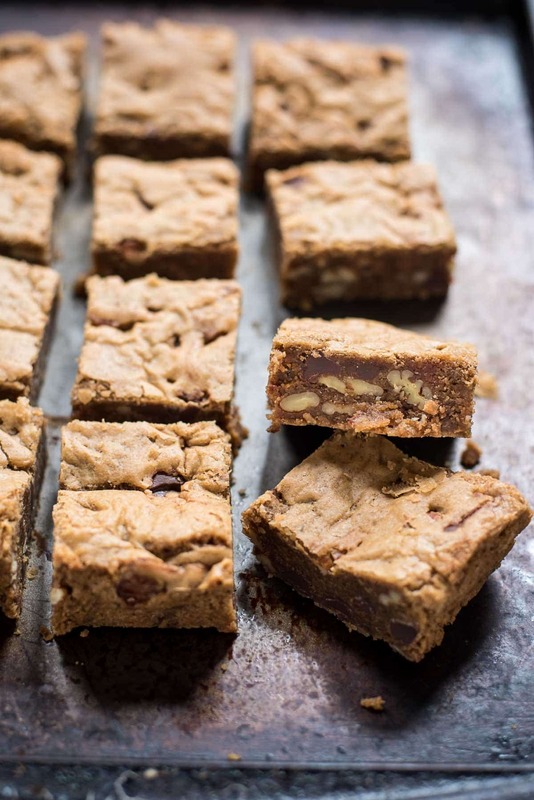 Some think of them as a chocolate chip cookie in bar form. Some prefer nuts, others white chocolate or butterscotch chips. I personally wanted a blondie that was distinctively butterscotch in character. I wanted brown sugar and butter to be the prominent flavors, set in a chewy, nutty bar with crackly tops. With that in mind, I got to work. I started with the recipe for standard blondies which happens to be wonderfully simple. Most recipes call for 1 cup of flour, 1 cup of brown sugar, 1 egg, 1 stick of butter, a teaspoon of vanilla and a scattering of mix ins–whether chocolate or nuts or butterscotch. Honestly, this basic recipe is really good, and practically impossible to screw up. 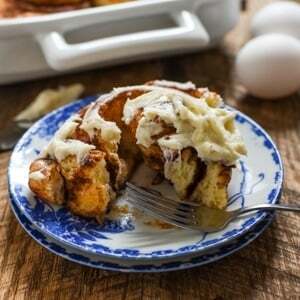 After all, you can’t really go wrong with butter and brown sugar. Still, I didn’t quite feel this recipe was my absolute favorite, so I started experimenting. I really wanted a richer base, so first I browned the butter. I can’t think of a single occasion when browning butter has been a bad decision. The flavor is instantly intensified, taking on nutty, caramely undertones. Yep, the brown butter was definitely here to stay. Next, I decreased the amount of chocolate chips. I know, it sounds crazy. Can you really have too much chocolate? But the truth is, the chocolate totally overwhelmed the brown sugar in my first batch. 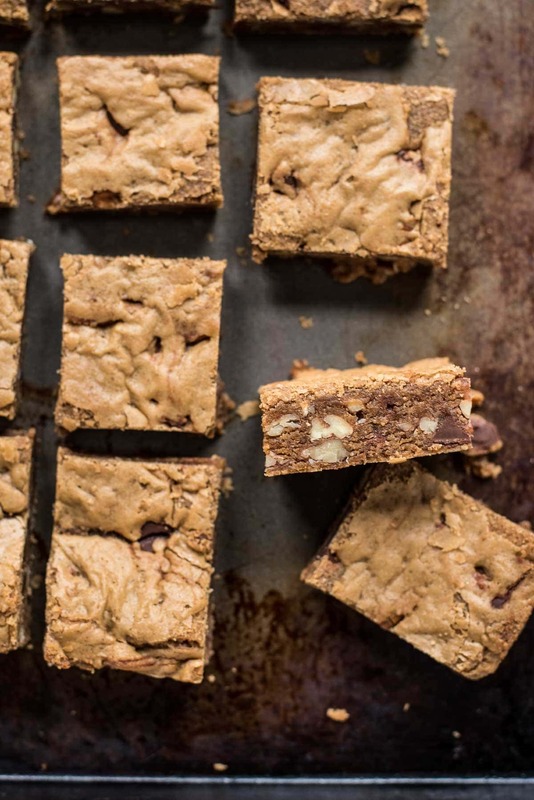 And as much as I love chocolate, these are blondies, not brownies. All they need is a light sprinkling of semi-sweet chocolate chips–just a hint of bitterness to play off the richness of butter and brown sugar. I decided after two batches that my ideal blondie does indeed have nuts, but rather than using the more traditional walnut, I preferred the sweeter flavor of toasted pecans. In an attempt to further amp up the butterscotch notes in these, I also experimented with using dark brown sugar instead of light. Interestingly enough, my favorite batch actually used light brown sugar with a Tablespoon of molasses, but for simplicity sake, dark brown sugar will achieve a similar result. As with any recipe that calls for so few ingredients, quality can make a big difference. Good butter, pure vanilla extract (bourbon vanillas are especially wonderful in this recipe), Kosher salt, and high quality chocolate all make the humble blondie a standout dessert. What follows, my friends, is now my go-to blondie recipe. It is dark and rich, with a crackly crust which gives way to chewy centers. From here, you can adapt as you see fit, adding your own favorite nuts, increasing the chocolate, or omitting it altogether. While browning the butter will take a little bit more time than your standard recipe, this still manages to come together in 20 minutes in a single bowl. And unlike cookies, which have the unfortunate need to be refrigerated before baking, these can be made and out of your oven in under an hour. It’s the kind of gold standard you’ll want to add to your collection. Preheat the oven to 350 degrees. Line an 8 x 8 inch pan with foil, letting it hang over the sides so you have a sling to remove the blondies from the pan. Spray the foil with cooking spray. In a small pot over medium heat, melt the butter. Continue to cook, swishing the pot occasionally, until butter is frothy and turns a deep, caramel brown. Pour the butter into a medium sized mixing bowl, leaving most of the brown sediment behind. Set aside to cool while you toast the pecans. Place the pecans in a dry skillet over medium heat. Toast for 3-4 minutes or until fragrant. Set aside. Add the brown sugar to the butter and whisk until well combined. Add the egg and molasses and whisk until smooth. Whisk in the vanilla. Add the flour, baking powder, and salt on top and stir until well combined. Stir in chocolate chips and toasted pecans. Spread the mixture into the prepared pan then bake for 21-25 minutes or until set on the edges and golden brown. 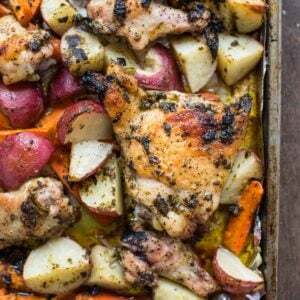 Remove from oven and allow to cool before removing from the pan and slicing. if you don't have molasses, you can omit it and use dark brown sugar instead of light. 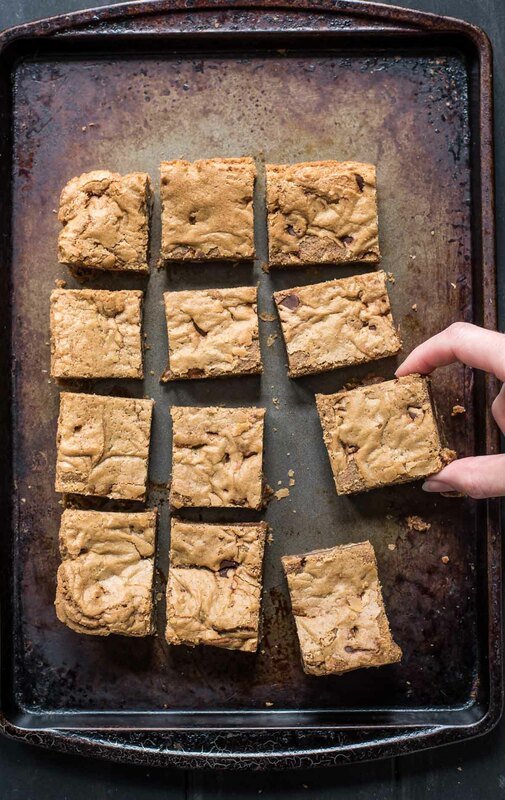 I’m a huge lover of blondies, but don’t think I’ve ever had one made with brown butter. YUM! Bet these would be good with butterscotch chips or peanut butter flavored chips instead of the chocolate chips too! Gotta try this one soon. Looks fabulous and easy! I was actually thinking about you when I made these! I think they’d be great with butterscotch or no chips at all! These are SO amazing! I made them last week and I’m already making another batch! I will definitely be coming back to this recipe again and again. That is wonderful! I’m so glad you enjoyed them. Thanks for coming back to let me know!